Your data center keeps your business running. It allows you to stay connected to the internet and backs up vital business data. Data center crashes and outages can lead to both data loss and a dramatic drop in productivity. The frustration that comes from such incidents is just the tip of the iceberg. Data center failures can have far-reaching effects that can be devastating in terms of business relationships and financial losses. 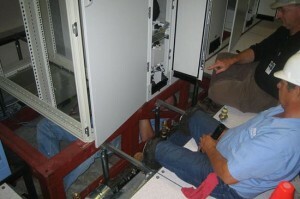 With so much at stake, it is imperative that your data center build be carried out by a qualified professional. While you may be tempted to save some money by using the services of a talented and well-intentioned employee, this choice is a gamble with high stakes. There are a number of factors that go into data center construction. Hardware must be acquired and properly connected. Software must be installed. However, the complexities of a data center go much deeper than these surface level simplicities. Whoever is building a data center must ensure that there will be effective backup storage integrated into the design. Security measures must be put in place to protect the data center from infiltration by hackers as well as infection from computer viruses. Effective cooling system installation is also a key factor in any data center build. Putting all this together represents a complex interplay between power, equipment, and security that should only be taken on by an experienced engineer. When selecting a qualified engineer for you data center build, you will need to have a basic understanding of the key components of a data center as well as the general issues involved in data center design and data center construction. This basic knowledge is essential in helping you select an engineer that is both knowledgeable and experienced. Come interview time, you want to be able to ask the right questions and understand the requisite answers from qualified service providers. A qualified data center engineer will be intimately aware of cutting edge data center technology. They will be certified in data center design and implementation. They will have ample experience to justify your confidence in their management of your data center build. These characteristics are not trivial technicalities. Using the services of a qualified data center engineer to build your data center dramatically increases the quality of your outcome. The results will be a stable data center with non-existent or infrequent interruption, adequate and reliable backup power to keep your data center running despite blackouts or surges, and a sense of solid data security. Data centers are a necessity in the modern business world. While they provide incredible capability and storage, they also introduce unique complications. A solid data center build begets, and even requires, the skills of a certified engineer. While utilizing the services of such a professional may have a greater impact on your budget than using less qualified, internal staff, this investment is unquestionably worthwhile. Using a professional will improve the speed and the quality of your data center construction and will save you the frustration of having to back pedal during any portion of the build process. In short, using a qualified professional will save you time, increase the likelihood proper data center function, and avoid the frustrating and expensive consequences of build errors that result in data center dysfunction. This entry was posted in Data Center Build, Data Center Construction, Data Center Design and tagged Data Center Construction, data center design. Bookmark the permalink.